KANSAS CITY, Mo., June 21, 2017 /PRNewswire/ -- Loews Hotels & Co, a wholly owned subsidiary of Loews Corporation (NYSE:L), and KC Hotel Developers LLC announce a partnership to build the new Loews Kansas City (KC) Convention Center Hotel. Loews Hotels is a joint equity partner in this venture. Construction will begin later this year for a grand opening in early 2020. Welcoming guests for nearly six decades, Loews Hotels has become a leader in distinctive properties that cater to groups, business, leisure, and family travelers in key urban and resort destinations throughout the United States and Canada. "Adding to our hotel landscape with a new convention center hotel is very exciting for Kansas City," said Sly James, Mayor Kansas City, MO. "To be able to leverage the Loews Hotels' reputation and that of its chairman, Jonathan Tisch -- one of the biggest advocates for the travel and tourism industry -- is an added bonus for our entire destination." "We are excited to have Loews Hotels as our partner in every aspect of the KC Convention Hotel project," said Mike Burke, principal at KC Hotel Developers LLC. "With their substantial equity investment and their management expertise, we have a complete alignment of interests in making sure the hotel is financed, built and operated successfully. Loews is known for expertly operating large group hotels with 4-star-plus quality that are tailored to the individual markets, for creating a great work environment for their employees and for being very involved in the communities where they operate. We have been impressed by the commitment of Loews' senior management to Kansas City and to this partnership." 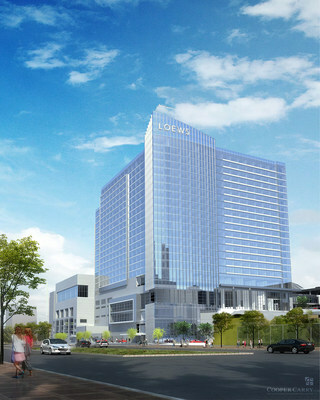 Loews Kansas City Convention Center Hotel will showcase 800 guestrooms, a lobby bar, signature restaurant, three meal restaurant, indoor lap pool and 60,000 square feet of meeting and event space, which connects directly to the Kansas City Convention Center with a new connector bridge. The hotel is also in walking distance to key attractions and other destination landmarks like the Kansas City Power & Light District, Sprint Center, KC Streetcar and the Kauffman Center for the Performing Arts. "At Loews we carefully and deliberately choose which markets to enter and we are extremely pleased to have the opportunity to add to our Midwest footprint with the new Loews Kansas City Convention Center Hotel," said Jonathan M. Tisch, Chairman & CEO, Loews Hotels & Co. "Kansas City is a vibrant destination and we look forward to investing in and becoming an active part of the community." "Kansas City has serious momentum. In addition to a remarkable arts and culture renaissance, our city is also experiencing healthy gains in visitor traffic and hotel demand, proving the time is right for this project," said Ronnie Burt, President & CEO, Visit KC. "This new hotel offering will enable us to continue raising the bar in Downtown Kansas City as we elevate the Kansas City convention and visitor experience. We're privileged to have a partner of the caliber of Loews Hotels on board, as they are a proven leader in the meetings and conventions landscape." Loews Kansas City Convention Center Hotel is expected to create approximately 2,000 new jobs for Kansas City, including 1,400 construction jobs and more than 500 permanent jobs. Headquartered in New York City, Loews Hotels & Co hospitality company is rooted in a deep heritage in the hotel industry and excellence in service. The hospitality group encompasses branded independent Loews Hotels, and a solid mix of partner-brand hotels. Loews Hotels & Co. owns and/or operates 24 hotels and resorts across the U.S. and Canada, including Hotel 1000 in downtown Seattle and the Loews Sapphire Falls Resort at Universal Orlando, the fifth hotel in partnership with Comcast NBC Universal. Located in major city centers and resort destinations from coast to coast, the Loews Hotels portfolio features properties grounded in family heritage and dedicated to delivering unscripted guest moments all with a handcrafted approach. For reservations or more information about Loews Hotels, call 1-800-23-LOEWS or visit: www.loewshotels.com. KC Hotel Developers, LLC comprises a group of investors concerned about Kansas City's convention-city status. KC Hotel Developers serves as the primary partner in the development of the new Kansas City Convention Center Hotel project.